There were Oklahoma State teams competing all over the place this weekend. From Stillwater to Ames to Phoenix, here’s a recap of the busy weekend. Make it back-to-back Big 12 sweeps for the OSU softball team. The No. 14 Cowgirls traveled to Iowa State this weekend and beat the Cyclones 12-3, 6-3 and 12-5 after sweeping Kansas in Stillwater last weekend. 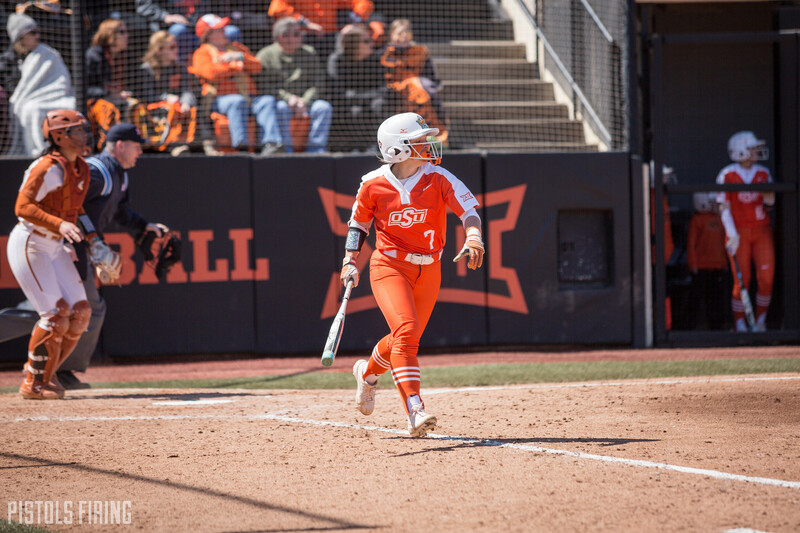 It was a big weekend for OSU outfielder Rylee Bayless. Bayless was 10-for-12 at the plate in the series, scoring five runs and driving in two more. The weekend brings her season batting average up to .367, which leads the team among players with at least 15 at-bats. The Cowgirls hit five home runs this weekend, giving them 61 in their opening 43 games. OSU’s team record for home runs in a season is 62, a record that was set last season. It’s a light week for the Cowgirls, as they play only one game. OSU will host Tulsa at 6 p.m. Tuesday. If combined runs determined series, OSU would’ve locked this one up on Friday, but instead the Cowboys dropped their second straight conference series. The Pokes hit a program record 12 home runs against Kansas on Friday, winning that game 27-6. Trevor Boone and Christian Funk each had three homers. Alix Garcia hit two, and Colin Simpson, Andrew Navigato, Bryce Carter and Cade Cabbiness each hit one. The good times didn’t last, though, as the Cowboys dropped Saturday’s game 5-4 and Sunday’s game 7-6. Each of those games ended in a walk-off, with Sunday’s going into extra innings. Earlier in the week, the Cowboys picked up a 1-0 victory against Wichita State. The Cowboys used nine pitchers to complete the shutout. The game’s only run came in the fifth, when Noah Sifrit hit an RBI-single that scored Cabbiness. Despite dropping consecutive series, the Cowboys are still in second in the Big 12 behind Baylor, as the conference has been a bit of a blood bath to this point. The Cowboys host Dallas Baptist at 6:05 p.m. Tuesday night before hosting Texas in a three-game series this weekend. The Cowgirls continued their winning ways, picking up two victories this weekend. No. 11 OSU defeated TCU 6-1 on Friday and Texas Tech 4-2 on Sunday. The Cowgirls finish the regular season second in the Big 12 at 8-1. Texas, OSU’s only conference loss, is 9-0. Up next is the Big 12 Championship in Lawrence, Kansas. As the No. 2 seed, the Cowgirls’ first match will be Friday. The Championship match is Sunday. The OSU men’s tennis team is in quite the rough patch. The Cowboys have lost their past three matches, but all have come against Top-10 opponents. OSU nearly upset No. 1 Texas on Friday, but fell 4-3. The Cowboys won the doubles point against the Longhorns before Texas won the first three singles matches. OSU sophomore Matej Vocel then upset No. 8 Christian Sigsgaard on Court 1, and Brady Draheim picked up a victory on Court 6, leaving it up to Court 3. UT’s Leonardo Telles took the first set 6-4, but Mathieu Scaglia took the second 7-5. Telles went on to win the final set 6-3. The Cowboys lost to No. 10 TCU 4-1 on Sunday. OSU will meet the Horned Frogs again Friday in the three/six matchup of the Big 12 Championship in Lawrence. The Cowboys were without Viktor Hovland this weekend, who was busy being the low amateur at the Masters, and the Pokes could’ve used him. OSU finished fourth at the ASU Thunderbird Collegiate in Phoenix. As a team, the Cowboys finished 2-under, 18 shots behind winner and host Arizona State. Matthew Wolff and freshman Rasmus Neergaard-Petersen finished tied in 11th at 2-under 211. Neergaard-Petersen competed individually, though, so his score didn’t count toward the team. The Cowboys will be back in action at the Big 12 Championship, which starts April 26 in West Virginia. The Cowgirls finished their spring schedule unbeaten. OSU defeated Central Arkansas 3-0 on Sunday, making the Cowgirls 5-0 this spring. Perhaps more impressively, the Cowgirls won those five games a combined 12-1. The Cowgirls are in competition at the Big 12 Championship in Broken Arrow. As of this writing, the Cowgirls are in sixth at 23-over. Texas the tournament at 1-under. Han-Hsuan Yu leads the Cowgirls at 2-over, tied for seventh. OSU had a pair of gold medalists at the John McDonnell Invitational in Arkansas this weekend. OSU freshman Juan Diego Castro ran the 800-meters in 1:49.58, good enough for first, and Molly Sughroue won the women’s 1,500 in 4:17.81. The OSU men’s and women’s team combined to finished in the top three in 13 events.